The literature recognition carried out in the second chapter has allowed the identification of the major dimensions underlying the developed model. As highlighted, the objective of this study is the empirical verification of customer behavior in a business-to-business (B2B) market. B2B has particular structural connotations: first of all, with regard to the demographic features of customers (professionals in the industry compared with end users), their buying capacity (in bulk rather than at the retail level), their bargaining power (directly linked to a better ability to trade on the types of purchases made in relation to variables such as “time continuity” and “volume of purchases”), and the determinants of their loyalty (B2B operators compared with B2B customers tend to be more rational when purchasing. The balance is often given by variables such as price, speed of the purchasing process, product availability, and the elements of customer service. Therefore, as B2B operators are more informed and rational when purchasing, they are potentially more disloyal.) Thus, the literature shows that in a digital economy, and in particular in the B2B sector, the need to induce the creation of a client shopping script is vital for companies that aspire to maximize the spontaneous resistance to change of their customers. The presence of a shopping script provides the individual with a sense of order, organization, and structuring of stimuli from the environment, simplifying the management of cognitive activity (Benjafield, 1992). These benefits inherent in the script would justify a substantial reluctance by individuals to change the buying patterns in use. 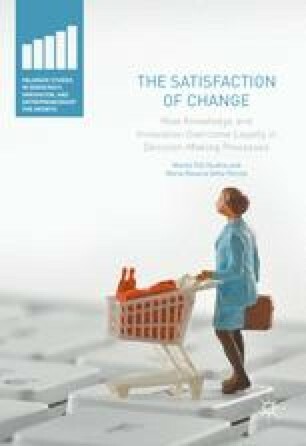 Moreover, the tendency of consumers in B2B markets to maintain their purchasing patterns, thus speeding up the buying process (which is a critical factor for a company or, more generally, a professional) and not reviewing the assumptions of the established pattern, is precisely the cognitive manifestation of spontaneous resistance to change the acquired patterns (Johnson, 1994).